Below is the Official Map detailing the organisation of the 4th Light Horse Brigade prior to making the famous charge. The map was produced by the cartographic section of the Egyptian Expeditionary Force in Cairo. The interesting item information in this map is the arrangements of the regiments in the charge formation. The 12th LHR is line abreast in the front line followed by the 4th LHR and then the Brigade support services of the Field Ambulance and Machine Gun Squadron. The good thing about this map is the display of topography which is accurate. 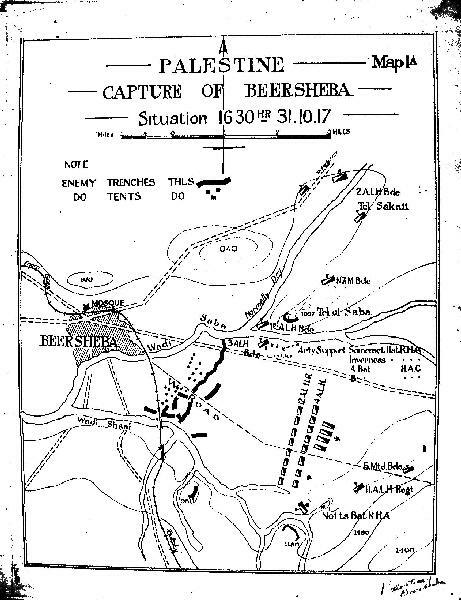 As with the Massie Map, the charge lines were formed in the shadows of Tel el Saba.